MSRP: Starting at $92,413 USD. 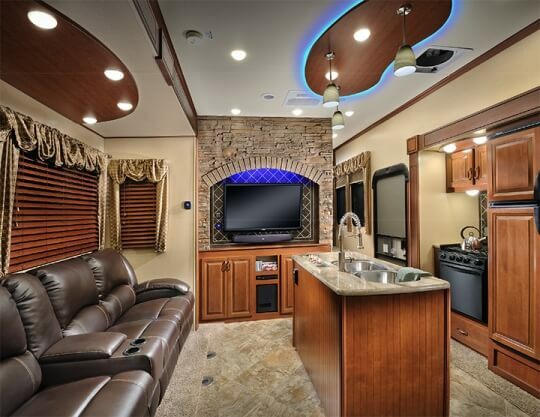 Adventure awaits you when you purchase this magnificent New 2015 Vengeance 39B12 Touring Edition Toy Hauler Fifth Wheel by Forest River! 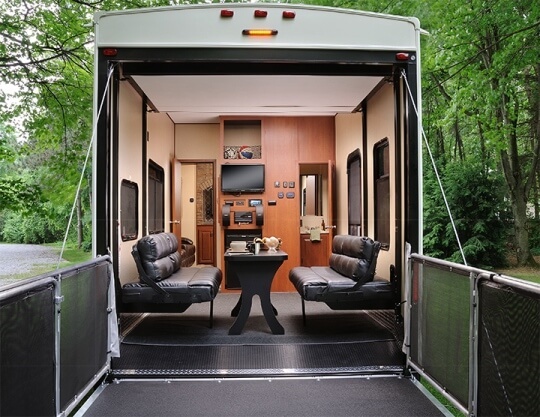 The Touring package along with the triple slides and a large cargo area for your off road toys make this Toy Hauler one that is sure to impress. 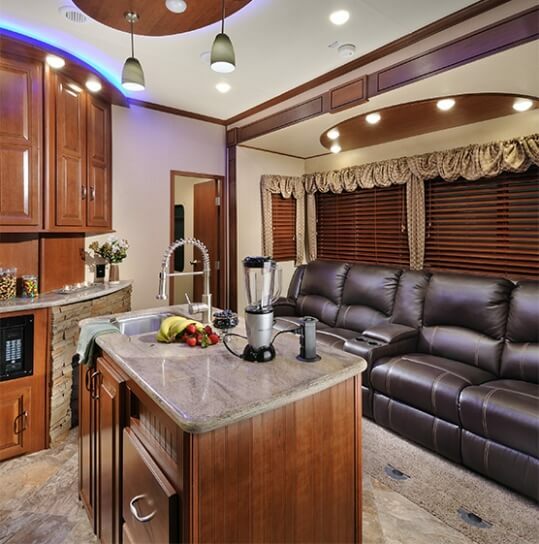 As you enter the fifth wheel, you will be in the main living and kitchen area. In the middle of the kitchen you will see an island which contains the kitchen sink and extra counter space. 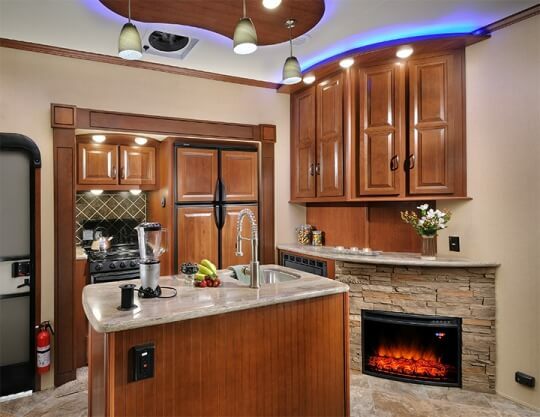 To your left there is a slide with a three burner range and refrigerator and beside the slide you will find a rustic stone faced fireplace. On the opposite side there is another slide that contains the plush and relaxing theater seating. To your right and up the stairs, there’s a bathroom on the left. 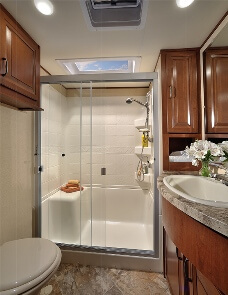 Inside the bathroom you notice the wide space that contains a ceramic toilet, a full size walk-in shower with a seat and residential shower head plus a large counter with a full sized sink. 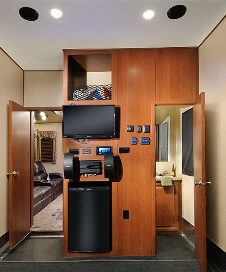 The front bedroom offers a king bed slide, dresser, and a front wall wardrobe with a washer and dryer prep and built in nooks for shoes making this the best place to relax in after a hard day of playing outside. 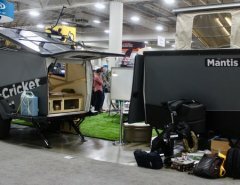 In the garage area there is plenty of cargo space for your off-road toys. 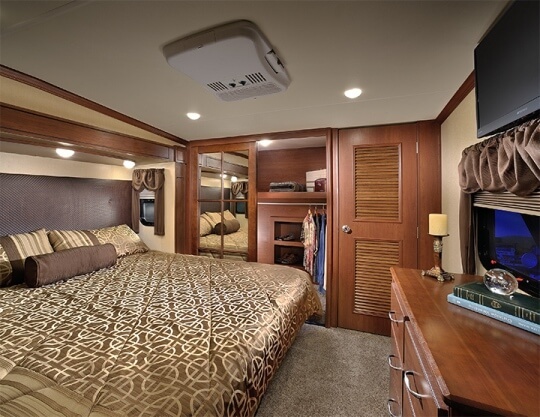 As you enter, you will find an electric bed lift with sofas below the bed and in the corner of the cargo area there is a half bath as well. 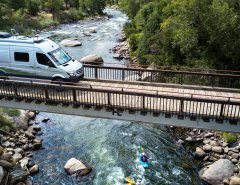 Once you get to your location, the large 8 foot ramp makes it is easy to off-load your toys. 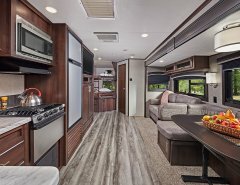 The ramp also easily converts into patios, so you can enjoy relaxing outdoors while still having the convenience of being close to the inside of the fifth wheel.